The Thomas Reade Rootes Cobb House is a historic home in Athens, Georgia managed by the Watson Brown Foundation. The home is both a museum and education center celebrating the life of T.R.R. Cobb in addition to the Civil War era history of the American South. 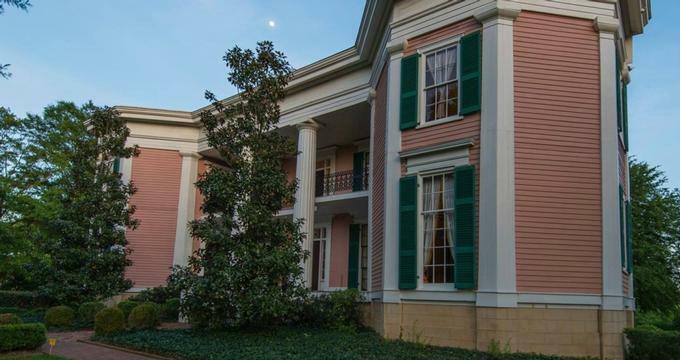 The Greek Revival style home, currently located just a short walk from its original site, has been refurbished to reflect the period 1852-1862 when Tom Cobb was at the height of his brief career. Built in 1834, the home’s original floor plan was a four over four Plantation Plan. The house was a wedding gift to Cobb, from his father in law, Chief Justice of the Georgia Supreme Court, Joseph Henry Lumpkin. In the late 1840’s, as his success as a lawyer grew, Cobb significantly expanded the home to include additional rooms, two signature wings, and a two-story front portico lined with Doric columns. Cobb lived in the home until his death in 1862. His wife, Marion, sold the home in 1873. The home is organized into two exhibition spaces. The main floor plan is decorated with period furnishings and resembles what it would have looked like in the mid-1800’s when occupied by Tom Cobb and his wife. The upper floor is of contemporary design and offers exhibit space and display cases to hold rotating exhibits that illuminate the history of 19th century Georgia. Artifacts include historic weapons, documents and photographs, as well as copies of speeches made by T.R.R. Cobb and his contemporaries. Highlights of the renovations include the formal parlor, traditionally the most lavishly decorated room in the house. Most of the furnishings here belonged to Cobb’s brother. Floorboards are original here and throughout the main first floor rooms. The dining room is set up as it would have been for a large party, with chairs against the walls. A sugar chest would have held valuable sugar and spices. Silver is engraved with Cobb, and the China, which was a gift to Cobb’s brother in the 1850’s was originally used in the governor’s mansion. A guestroom showcases the Confederate battle flag that graced Cobb’s coffin after his death. He died at the age of 39 in the Battle of Fredericksburg in 1862. A resource room on the second floor is available to researchers by appointment and contains non-circulating secondary sources related to the Civil War, Victorian-era architecture, decorative arts in the south, and southern culture. History: Thomas Reade Rootes Cobb, known as Tom, was born in 1823 and is considered one of the first citizens of Athens, Georgia, although he was not born there. One of Georgia’s most prominent lawyers, Cobb was an officer in the Confederate Army. He was a fierce advocate for state’s rights, a supporter of slavery, and a politician devoted to Southern Nationalism in the mid-1800’s. The home, originally located in Athens, lay abandoned 70 miles away in Stone Mountain, Georgia for over 20 years. The current address is just two blocks from the home’s original site. In 1873, when Marion Cobb sold the home it was used as a boarding house, fraternity house, and rental property until 1962 when it was purchased by the Archdiocese of Atlanta. When the Archdiocese threatened demolition of the home in the 1980’s, the Stone Mountain Memorial Association intervened to save the home and moved it to Stone Mountain Park. Plans to refurbish the home at the location were met with budget constraints and the home sat abandoned for nearly 20 years. In 2004, the Watson-Brown Foundation moved the home back to Athens with the assistance of a generous grant from the Stone Mountain Memorial Association. The home opened in 2007 as a historic house museum, and in 2008 was awarded the Georgia Trust’s Preservation Award for its excellence in renovation. The home and its programming is funded by the Watson Brown Foundation with supplemental income from site rentals for events and private programming. The Watson Brown Foundation was founded in 1970 and aims to preserve the history of the ‘spiritual founders’ of the South and educate the public through responsible scholarship. The foundation owns and manages three historic sites in Georgia. Ongoing Programs and Education: Tours of the home may be self-guided. Groups can reserve 45-minute guided tours. Detailed Lesson Plans are available for educators interested in field trips. Topics cover Cobb’s role in the Georgia Secession Debates, as well as the role of wealthy women, and economic motives for secession.